Cleaning the cooker is a chore we put off for as long as possible. Yet, failing to remove grease or burnt on food from the appliance can increase the risk of faults and unpleasant odours. When talking about cleaning your cooker, we also mean the hob and cooker filter. The most important step to keeping your cooker free from grease, burnt on food and unpleasant odours, is to clean it on a regular basis using a specialist cleaning product. Hob and Oven Micro Fibre Cloth Pack.For those who’d prefer not to use a chemical based cleaner for their cooker, the Hob and Oven Micro Fibre Cloth pack from E-Cloth is a must.Using only water, the fabric side of the cloth lifts and removes grease throughout the cooker. Whilst the toughened, non-scratch strips tackle the majority of stubborn stains and caked on dirt. Oven Brite Oven Cleaning Kit.The kit includes everything you need to give your cooker a thorough clean. From bags which make the cleaning of shelves easy, through to a cleaning solution which cuts through grease with ease. NB: When using a cleaning solution, take care to avoid the heating element and fan, as a cleaning solution on these components can cause damage. Whilst it is important to clean the cavity of your cooker, it’s equally important to clean the cooker door and exterior. To provide your cooker door with a thorough clean, follow the advice outlined in our “How to Clean or Replace the Glass in an Oven Door” article. As for the exterior, this can be cleaned with an everyday multi-purpose household cleaner. Your cooker hob is susceptible to grease splatters and food spills. To help tackle dirt, each time the cooker hob is used it should be cleaned using a specialist hob cleaner. The Easy-Do Hob Cleaner and Conditioner does a great job. The cleaner and conditioner cuts through caked on grease and grime with ease, it also cleans, polishes and protects your hob, leaving a silicon film – making the next clean even easier. For stubborn burnt on food which cannot be removed with a cleaner, consider using a hob scraper, which will lift the food without damaging the hob surface. The cooker hood plays an important role in the kitchen during the cooking process. So it’s important to make sure you regularly clean it, including the filter. To clean the exterior of your cooker hood, use a dedicated cleaner. We recommend the Wellco Stainless Steel Cleaner. The cleaner is designed to be sprayed over the surface and left for 60 seconds before being buffed with a soft dry cloth. The cooker hood filter should be replaced regularly. As a rule of thumb, for the average family who cook one meal a day at home, we recommend the filter is replaced every few months. Find out how to do this, by reading our “How to Replace a Cooker Hood Filter” article. By taking the time to clean each component of your cooker, you’ll help to keep the appliance working at its peak performance for longer and remove any unpleasant odours which have the potential to tarnish dishes being cooked. 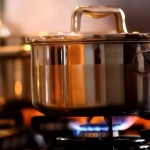 For more information on how to take care of your cooker, visit our advice centre and blog.